President Trump called Attorney General Jeff Sessions "beleaguered" in a Monday tweet concerning the Russia probe. Trump wrote, "So why aren't the Committees and investigators, and of course our beleaguered A.G., looking into Crooked Hillarys crimes & Russia relations?" The president also tweeted, "Sleazy Adam Schiff, the totally biased Congressman looking into 'Russia,' spends all of his time on television pushing the Dem loss excuse!" Trump's tweet mentioning Sessions comes just days after he openly expressed his frustration with the attorney general in an interview with the New York Times. According to the Times report, "Trump said...he never would have appointed Attorney General Jeff Sessions had he known Mr. 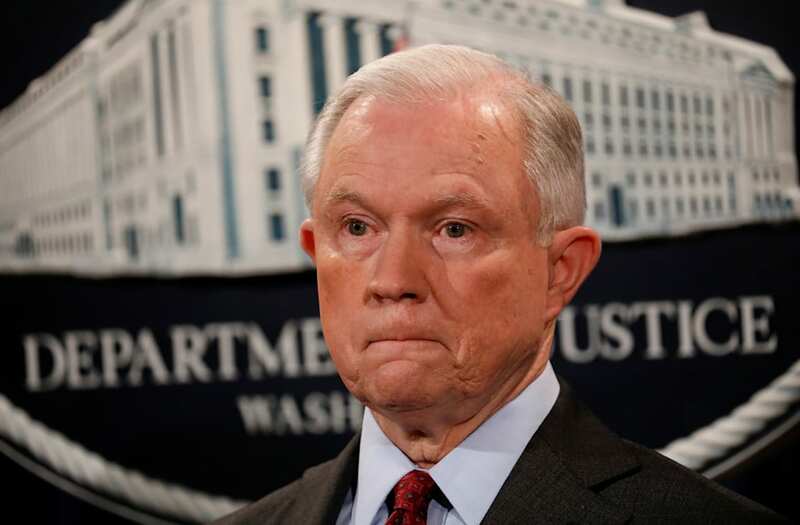 Sessions would recuse himself from overseeing the Russia investigation that has dogged his presidency, calling the decision 'very unfair to the president.'" When asked to clarify Trump's remarks, White House press secretary Sarah Huckabee Sanders said during an ABC News' 'This Week' interview on Sunday, "the president knows the attorney general is trying hard and he appreciates that. But at the same time, he's disappointed that he chose to recuse himself." The day after the president's criticism, Sessions addressed speculation about his resignation. "I have the honor of serving as attorney general. It's something that goes beyond any thought I would have ever had for myself," Sessions told reporters. "We love this job, we love this department and I plan to continue to do so as long as that is appropriate." A recent Washington Post report is another reason Sessions has drawn significant media attention over the past few days. The Post reported Friday, "Russia's ambassador to Washington told his superiors in Moscow that he discussed campaign-related matters, including policy issues important to Moscow, with Jeff Sessions during the 2016 presidential race, contrary to public assertions by the embattled attorney general, according to current and former U.S. officials."